North Tudor Medical Center in GTA IV. North Tudor Medical Center is a hospital in Grand Theft Auto IV, addressed at 169 Babbage Drive in Acter (despite the fact that it is named after "North Tudor"), Alderney, Liberty City. It is a few blocks from the Lost MC Clubhouse. Based within a large historical three-story building, North Tudor Medical Center serves as a respawn point after the player is wasted the nearest to the hospital. Much like most hospitals in the game, the hospital has no interior, but features parked Ambulances towards the rear, as well as a health pack at the steps of the hospital's northeastern entrance. 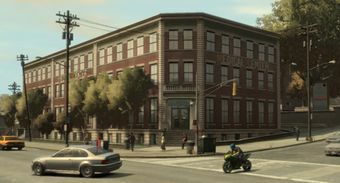 The rear drivaway of the hospital serves as place for a switchover of cars during "To Live and Die in Alderney" in GTA IV. Oddly, the hospital is named for the North Tudor location in the Tudor neighborhood in Alderney, but is actually situated in Acter, similar to the Westdyke Memorial Hospital, which is actually located in Leftwood. This page was last modified on 19 July 2012, at 18:57.